Heartworm infestation in pets is extremely dangerous and, if left untreated, can be fatal. The parasite is transmitted through mosquitoes and can be found in dogs and cats. Protecting your pet from this dangerous parasite is essential in our region. Mosquitoes are EVERYWHERE in our area – without protection, every pet is at risk, even indoors. For your convenience, Old Dominion Animal Hospital carries a wide range of heartworm protection products right here in our Charlottesville animal hospital. Our veterinarians can ensure the consistency and the quality of the medications we dispense. By purchasing your products from us, we are able to record this information in your pet’s medical records for future use. Also, our vet clinic is often able to offer you rebates or even free heartworm prevention products here in the Charlottesville veterinary pharmacy that are not available to customers on-line. Check our Specials page for special offers when you buy in multiples. While these offers are not always available, we do our best to remain informed so that we can offer you the best possible deal on your pet products. 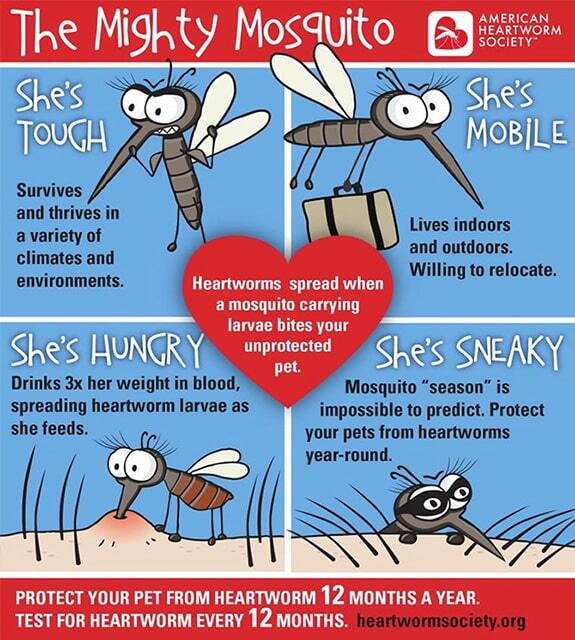 Visit the American Heartworm Society for great information about heartworm disease and disease prevention. If you prefer to order your heartworm protection on-line, Old Dominion Animal Hospital does have an on-line veterinary pharmacy available so that the products you need may be delivered directly to your home. Use our Online Store to sign in to the on-line veterinary pharmacy and shop. It’s that simple.